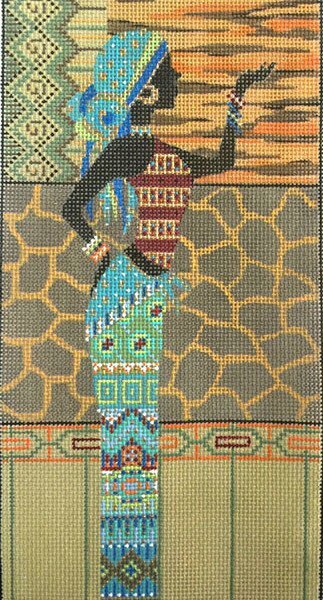 African Woman in Blue is a needlepoint design based on African art and is by Alice Peterson AP2884. The design area measures 6" x 13". The design is handpainted onto 13 mesh mono needlepoint canvas and is best suited to intermediate level stitchers. Can be purchased with or without fibers. If you select cotton we will send DMC cotton floss. For wool and silk we use Planet Earth fibers which are single-ply for 13 mesh and easy to stitch with. If you want to hold the canvas taut on stretcher bars while you stitch it then we recommend a pair of 10" and a pair of 17" plus some thumb tacks.